One of the most well-known benefits of having artificial grass is the lack of maintenance that comes with it. If you start to dread the prospect of having to mow your lawn every alternate week, perhaps it’s time to consider the no-hassle alternative. After all, the UK doesn’t exactly offer the best weather to cut the grass and the time spent mowing has the potential to be put to better use. Some people love gardening and others simply hate the thought of it. If you are finding no joy in tending to your garden, it’s time to make your life a little less stressful. With artificial turf, the days of removing pesky weeds are a thing of the past and you are then free to enjoy your lawn without the downside of it requiring constant aesthetic maintenance. 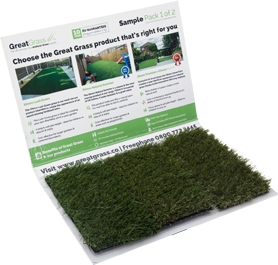 If you’re exhibiting some of the artificial grass symptoms above, it’s time to get in contact with experts here at Great Grass so we can begin the process of organising your very own artificial grass lawn! Once you make the swap, you’ll wonder why you hadn’t done it already!